This week, "Juke In The Back" features The Griffin Brothers, one of the unsung Rhythm & Blues groups from the early 1950s. Jimmy and "Buddy" Griffin began in their hometown of Norfolk, VA in the late '40 playing jump blues. They settled in Washington, DC and were asked to backup Roy Brown on "Hard Luck Blues" in April, 1950. That recorded went to #1 in August and soon the brothers had their own record deal with Randy Wood's Dot Records out of Gallatin, TN. 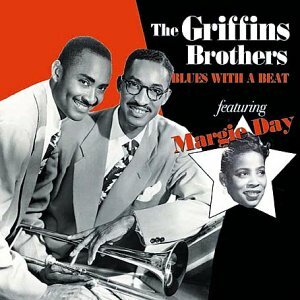 With vocalists Margie Day and Tommy Brown, The Griffin Brothers Orchestra scored six charting R&B hits from 1950-52, before embarking on separate solo careers in 1954. Matt The Cat features The Griffin's biggest hits, jumpin' B-sides and solo records on this week's "Juke." The Griffin Brothers were an important part of R&B's rise, scoring a #1 smash in early 1952 with "Weepin' & Cryin'" (featuring Tommy Brown on lead vocals) and now they're finally getting their due, even if time has left them behind. Blessed with perfect pitch and a resonant voice, vocalist and pianist Diane Schuur received her training at the Washington State School for the Blind. Today Schuur is a two-time Grammy winner and has performed at Carnegie Hall and the White House. Her album Diane Schuur and the Count Basie Orchestra spent 33 weeks at Number One on the Billboard jazz charts. On this week's Song Travels she swings on a few favorite tunes including "I Get Along Without You Very Well" and "The Very Thought of You."